Staffing agency, Recruiting for Good will reward referrals with fun Maui getaways to improve the quality of life for L.A.'s working professionals, and moms too. SANTA MONICA, CA, UNITED STATES, October 24, 2018 /EINPresswire.com/ -- Santa Monica based staffing agency, Recruiting for Good, is creating balance between work and fun time off by making it easier for individuals and families to experience rewarding Maui weekends. According to Recruiting for Good, Founder Carlos Cymerman, "We love rewarding paradise to people who make referrals and help Recruiting for Good make a difference (we share proceeds to fund Our Moms Work, community service). 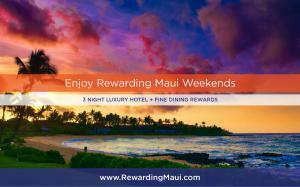 Join us to celebrate life, and enjoy luxury Maui getaways often." 1. Refer an open position at a company, when Recruiting for Good fills the position, and earns a finder's fee; a portion is rewarded to enjoy 3 night luxury hotel stay (Lahaina or Wailea) and a fine dinning gift card. 2. Refer a candidate in engineering or tech, when Recruiting for Good, finds the person a great job, and earns a finder's fee a portion is rewarded to enjoy 3 night luxury hotel stay (Lahaina or Wailea) and a fine dinning gift card. 3. If candidate is an engineering or tech professional, and submits their resume directly to Recruiting for Good to land a great job (and completes probation period), a portion of the fee finder'fee earned is rewarded to enjoy 3 night luxury hotel stay (Lahaina or Wailea) and a fine dinning gift card. Carlos Cymerman adds, "Feeling inspired from my recent trip to Hawaii Food Festival in Maui, I created these fun themed weekends; Beauty Foodie Party (girls weekend), Kickass in Maui (adventure seekers), and Mindful in Maui (relax and romance). Join Recruiting for Good to enjoy any of these awesome weekends."